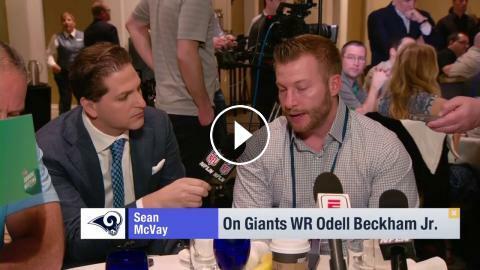 ﻿ Sean McVay on Rams free agency acquisitions & the potential of adding Odell Beckham Jr.
Sean McVay on Rams free agency acquisitions & the potential of adding Odell Beckham Jr. Which coach would you want for one game - Doug Pederson or Sean McVay? Is Odell Beckham Jr. a top 10 player in the NFL? Sean McVay mic'd up during the Rams OTAs: "How fast is Brandin Cooks Is that awesome"
Los Angeles Rams head coach Sean McVay: "We're in constant communication with DT Aaron Donald"
Breaking down Rams addition of Ndamukong Suh and the potential of adding Odell Beckham Jr.
Rams head coach Sean McVay on additions of Marcus Peters & Aqib Talib: "Let's ride, man"
Would it be smart for the Rams to offer two first round picks for Giants WR Odell Beckham Jr.? Are the Rams better off with Brandin Cooks than Odell Beckham Jr.?